Rep. John Lewis, D-Ga., poses for a photograph under a quote of his that is displayed in the Civil Rights Room in the Nashville Public Library Friday, Nov. 18, 2016, in Nashville, Tenn.
John Lewis is a Congressman from the American state of Georgia. He represents the city of Atlanta and its suburbs. Over the weekend, Lewis had this to say about incoming President-elect Donald Trump: "I don't see the President-elect as a legitimate president." When Chuck Todd, host of the Meet the Press news program, asked why, Lewis continued, "I think the Russians participated in helping this man get elected. And they helped destroy the candidacy of Hillary Clinton. I don't plan to attend the inauguration." The President-elect answered back in his tweets. He wrote that "Congressman John Lewis should spend more time on fixing and helping his district, which is in horrible shape and falling apart (not to mention crime infested) rather than falsely complaining about the election results. All talk, talk, talk - no action or results. Sad!" Many Twitter users sent their own messages in support of Rep. Lewis. Rather than him being "all talk and no action," they reminded Trump of the many actions that Rep. Lewis took as a civil rights protester and still takes as a Representative. Rep. Lewis took part in sit-ins to protest segregation in the southern United States in the early 1960s. He was beaten by mobs and arrested for being in the protests. State troopers swing billy clubs to break up a civil rights voting march in Selma, Ala., March 7, 1965. 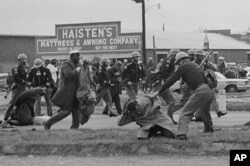 John Lewis, chairman of the Student Nonviolent Coordinating Committee (in the foreground) is being beaten by a state trooper. Lewis has been arrested at least 45 times, the latest arrest in 2013 during an immigration protest outside the U.S. Capitol. In June, 2016, Lewis led a sit-in on the floor of the House of Representatives to protest lack of action on gun control. Other representatives in Congress are following the steps that Rep. Lewis says he will take. Representative Mark Takano said he will also boycott the inauguration. According to Fusion.net, there are more than 40 representatives who have said they will not attend the inauguration. The list of representatives contains their reasons for not attending. Some commentators are criticizing the timing of Trump's attack on Rep. Lewis. The attack came on the weekend when Americans celebrated the birthday of Martin Luther King, Jr. as a national holiday. Trump had planned to visit the new Smithsonian Museum of African American History and Culture on Monday, which was Martin Luther King Jr. Day. Instead, he met privately in New York with the son of the Reverend Martin Luther King Jr.
Dr. Jill Robbins wrote this story for Learning English. Hai Do was the editor. Now it’s your turn. What do you think of the boycott of the inauguration? Do politicians in your country use social media to criticize each other? Write to us in the comments section or on our Facebook page. commentator - n. a person who discusses important people and events on television, in newspapers, etc.